This Tuesday, the Apple App Store celebrates its tenth anniversary The store opened for business with 500 apps on the shelves on July 10th, 2008. The other day, we took a look back at the most popular iOS apps from 2010 to 2018. Now, to show how the debut of the App Store changed the way people use their phones, approach their jobs and live their lives, Apple posted a list of quotes from iOS users, app developers and Apple executives, explaining how they were affected by the launch of the App Store. Before we get into the quotes, back on July 13th, 2009, we belatedly sang Happy Anniversary to the App Store. After one year, the 500 apps initially available had turned into 50,000. 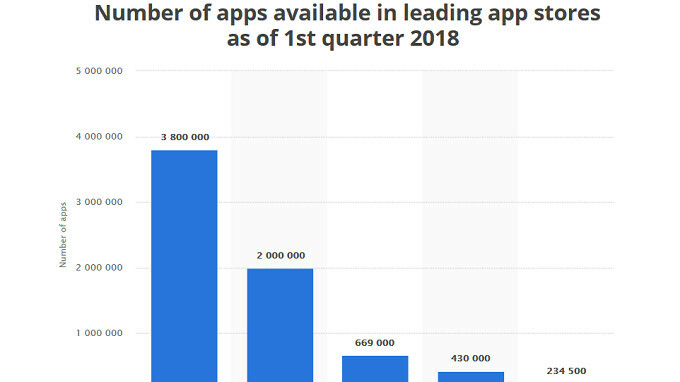 According to Statista, as of the first quarter of this year, the App Store carried two million apps versus 3.8 million offered to Android users in the Google Play Store (see the image at the top of this article). Still, the App Store generated revenue of $11.5 billion in the fourth quarter of 2017. That was nearly double the amount spent by Android users in the Google Play Store over the same time period, according to App Annie. How important is it to have a platform feature a fully stocked app store? Ask Microsoft and BlackBerry. The demise of Windows Phone and BlackBerry (pre-Android BlackBerry, of course) can be blamed largely to the dearth of apps available to both platforms. Happy 10th Anniversary Apple App Store; may the next ten years be just as exciting as the first ten were. Apple didn’t start the app store, but they sure as hell started the app craze. These are some incredible do it all pocket devices we carry, and I’m glad Apple and Google are at the forefront. It’s a win win for me. Then who started the App Store if it wasn’t Apple in 2008? That statement makes zero sense. Thanx bro. He was such a hurry to post, he failed to think. Just because he can, doesn’t mean he should. If you notice, I didn’t capitalize app store, meaning I’m using a generic term dude. Also Nokia had one before Apple. Do your fkn research, before you attack me. It’s was auto corrected capitalized turdburger. So please, enlighten the class what “app store” came out before Apples. Oh, Nokia had one of those worthless ringtone markets that no one ever used? Bish please. That’s like saying muskets weren’t the first rifles because cannons were made first. I get so tired of ‘tards who come up with their “well actually” moments to discredit companies, while making a fool of themselves. You got owned, and can’t own up to getting owned fool. Nothing more need be said. The App Store is it’s own business. Google's app store may have a greater number of apps, but the quality of said apps is mostly poor, I'm not saying you can't find crappy apps in Apple's app store, but they've quality standards higher than Google's. Nevertheless both offer a great selection of premium apps and for us the customer we always win thanks to the developers of both platforms.